Rediff.com » News » Can Rahul unscramble the foreign policy omlette? Can Rahul unscramble the foreign policy omlette? 'Alas, the Congress party offers no suggestions as to how to unscramble the omlette it cooked during 2004-2014 on which the Modi government may have since lavishly spread some tomato ketchup,' says Ambassador M K Bhadrakumar. The foreign policy resolution (external link) adopted at the Congress party's 84th plenary session on March 18 at New Delhi makes a revealing document. The Congress has a long tradition dating back to the pre-Independence era of elevating itself from its mofussil/parochial roots by adopting an internationalist outlook. The focus of the present document is once again on differentiating the Congress from its existential rival, the Bharatiya Janata Party. This a brave attempt, because it is not so easy to allege major departures in the Modi government's foreign policies, which are by and large signifying continuity. In some ways, arguably, the Modi government brilliantly outperformed the UPA -- breathing new life into relations with Russia and Iran or prioritising the West Asian region. The deficiencies today are largely due to flawed inheritance. 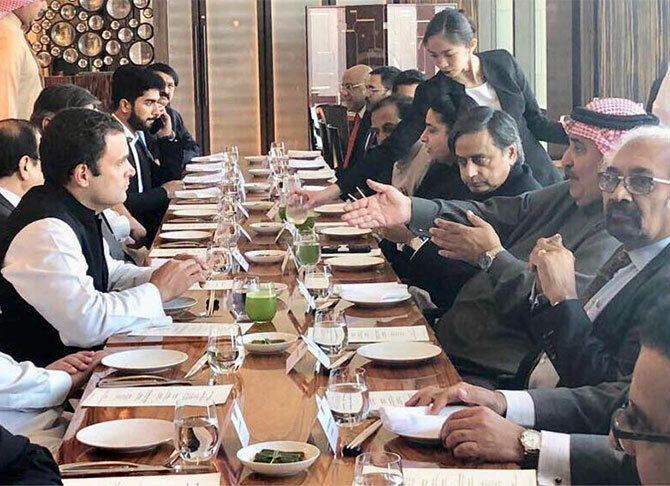 Fundamentally, the foreign policy served the class interests of the Indian elite, and the Congress and the BJP represent the same interests more or less. The foreign policies do not operate in a vacuum. They must be co-related with the rapidly changing international environment. The period since 2014 is marked by unprecedented volatility even as an entire slice of post-Cold War era broke loose and began drifting away following the US-backed 'regime change' in the Ukraine. Do not overlook that the Modi government came to power roughly at the same time when the gathering storms impacted the co-relation of forces internationally. The yardsticks to be applied, therefore, should also include how well the present government coped with the transformative period internationally. It is a stunning statement for three reasons. First and foremost, could this be the foreign-policy compass of our next government if the Congress emerges to lead yet another UPA regime in the coming parliamentary poll, which is no longer an incredible prospect on the political horizon? Incredible India! The lurch toward pro-US foreign policies that began during the NDA government led by Atal Bihari Vajpayee became a tilt and a veritable quasi-alliance with the US during UPA rule, especially UPA-II when the Congress jettisoned the moderating influence of the Left and plunged the whole hog into the Washington Consensus. In fact, but for the financial crisis of 2008, which hobbled the US' capacity to exercise global hegemony, the UPA might have galloped away on the American stud to the far horizon. Therefore, it must be the mother of all ironies that in the year marking the 10th anniversary of the Civil Nuclear Energy Cooperation Agreement, the Congress party is acknowledging the need to 'recalibrate' India-US relations. It puts a brave face by claiming that the 2008 nuclear deal 'marked the acceptance of India in the global mainstream, ending three decades of nuclear isolation', but the single biggest outcome of the nuclear deal has been the big breakthrough that the US achieved to penetrate and dominate the Indian market for weaponry. That, of course, eroded India's strategic autonomy. By the way, only last week, the commander of the US Pacific Command Admiral Harry B Harris underscored in a testimony before the US Senate Armed Services Committee in Washington that India is the 'biggest strategic opportunity' for the US -- as if India could substitute for a Texan Steak. Three cheers for Lockheed Martin and Boeing! If that is the Pentagon perception, who is responsible? The present NDA government? The previous UPA government? Rather, isn't it time past and time present telescoping as time future? Alas, the Congress party offers no suggestions as to how to unscramble the omlette it cooked during 2004-2014 on which the Modi government may have since lavishly spread some tomato ketchup. Thirdly, there is an inherent contradiction in the Congress party statement. For, it was during the UPA rule that India's relationship with Russia got significantly atrophied -- and, sadly, much of it happened during the period of Russia's resurgence on the world stage. One wonders at times if that wasn't a deliberate act on our part to drain the verve and life force out of the India-Russia relations. To what extent our bureaucracy acted under the influence of American mentors we do not know. But the progression of the US' containment strategies against Russia and the atrophy in India-Russian relations ran on parallel tracks and could that have been merely coincidental? The 'communication and trust with China' also became a casualty of the quasi-alliance between India and the US. Make no mistake, the 'Quad' was conceived in 2006 no sooner than the Bush administration proposed the nuclear deal and hustled India into signing an agreement on military cooperation. Again, it was Hillary Clinton who first coined the expression 'Act East'. She chose Chennai, after all, to make her magnificent Vision for the 21st century speech containing a clarion call urging India to be the lynchpin for the Obama administration's containment strategy against China. Didn't all this happen during UPA rule? Of course, the Modi government since greatly complicated the India-China relations by injecting 'muscularity' into foreign policies. The catastrophic result is all too evident today. But then, surprisingly, the Congress document keeps a deafening silence on this aspect of 'muscularity'. The Doklam faceoff, 'surgical strikes', Tibet-related issues -- the Congress document simply sidesteps the minefield. The document exposes that the Congress is locked in a deathly embrace with the BJP to appropriate not only soft Hindutva but also the national security State that India has come to be. Without doubt, the militarisation of India's foreign policies is traceable to the UPA-II era. The US arms exports to India are fueled by India-China tensions. As a result, interest groups proliferated. A nexus came into being involving fatcats, ideologues and bureaucrats (civilian and military). It is hard to see how the US will let go its vice-like grip on India even if there is a 'transfer of power' following the 2019 poll. More than ever, the US needs India rather than the other way around.